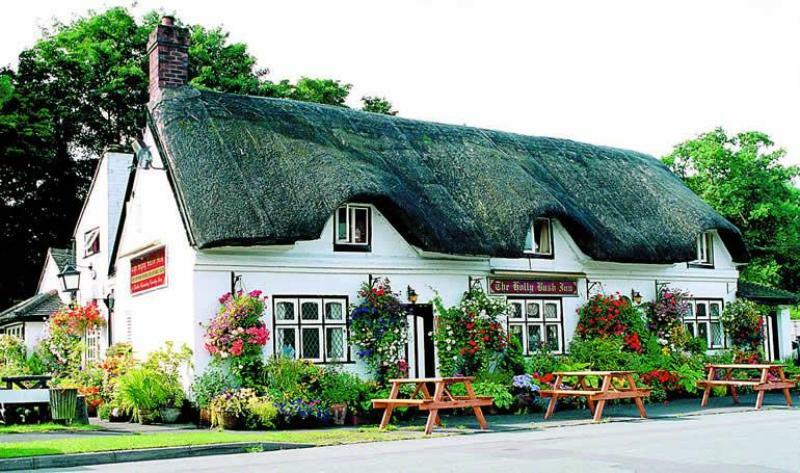 Reckoned to be the 'second oldest licensed pub in the country', the white-painted Holly Bush Inn puts on a good show with its deep-thatched roof, wooden plank ceiling, hefty beams and quaint curios. Dating from the fourteenth century, it has been immaculately preserved, with lots of cosy areas and old-fashioned touches such as a salt cupboard set into the huge inglenook. The kitchen makes admirable use of local produce, including cheeses from Fowlers of Earlswood (the oldest cheese-making family in England) for a hearty menu that steers clear of gastro-posturing in favour of honest, carefully crafted dishes. Floppy Staffordshire oatcakes are stuffed with black pudding, Cannock Chase venison is casseroled, free-range pork chops are given a mustard glaze, and there's steak and kidney pud to warm the cockles. The pub keeps an excellent stock of real ales, and there are plenty of quaffable wines on the short list - including a special 'mini bottle' selection for drivers. In summer, an eighteenth-century style wood oven is called into service for pizzas in the garden. Not up to usual standard ,the prices had increased from our previous visits and not good value. All are steaks are selected for us by Wm.Perry of Eccleshall and have been farmed locally, allowing us to give you the guarantee of quality from "farm gate to plate". All weights are approx. uncooked. All steaks are cooked to your liking and served with a grilled tomato. A selection of cheeses from Fowlers of Earlswood, the oldest cheese making family in England. Founded in Derbyshire before 1840 they have been using traditional skills to hand craft their award winning cheeses for 13 generations. A selection of four different cheeses with crackers served on an individual wooden cheese board.